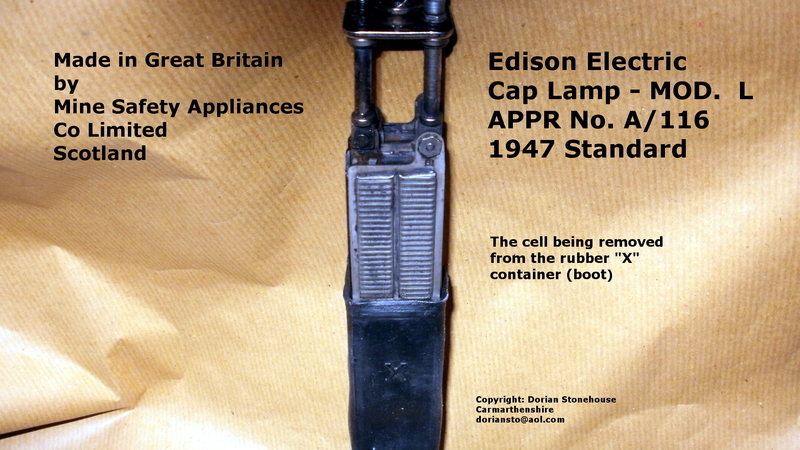 THESE circa 1947 edison nife cap lamps ⇓⇓ which include the model P, are really lovely pieces of history. But I’m one of those guys who want memorabilia to have function, form, and feeling – so it’s gotta work! 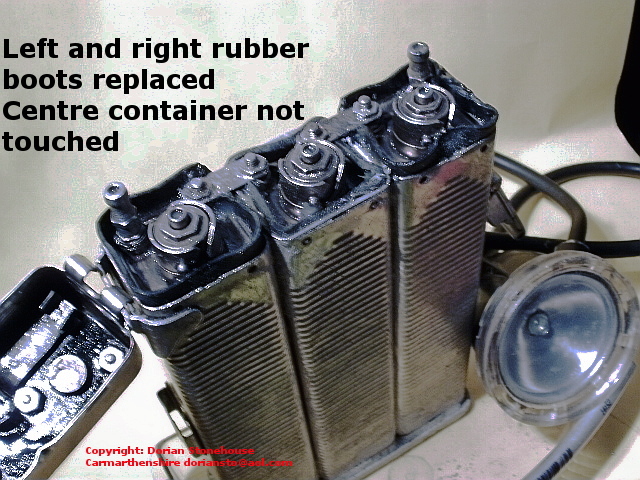 This usually means changing the three perished rubber containers (boots) that house each cell, as they leak electrolyte – everywhere! 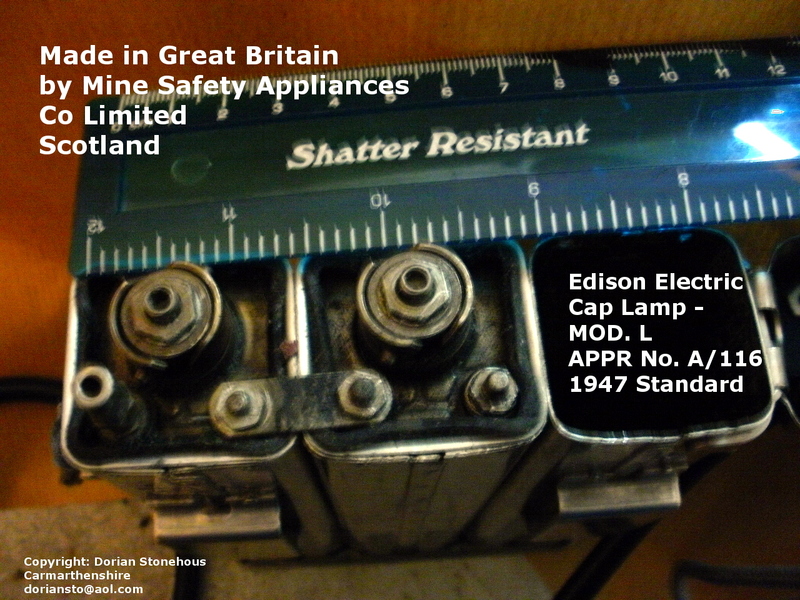 Removing the cap lamp bonnet to view the three cells ⇓⇓ was not too difficult – after plenty of releasing oil was used to loosen the lock mechanism. I used two little neodymium magnets to pull each catch outward⇑⇑ to release the lock, thereby enabling the top to be hinged upwards – and off it came ⇓⇓– nice one! 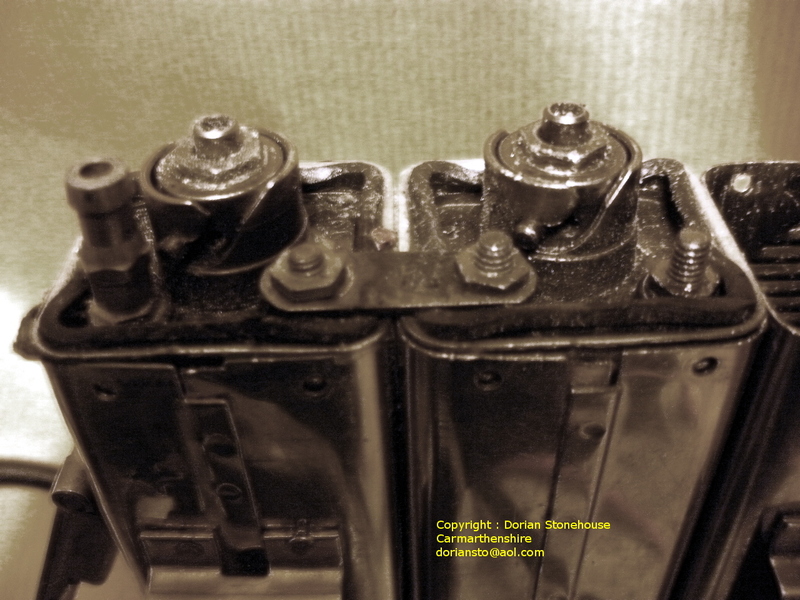 Next, I removed all cell-to-cell terminal straps⇓⇓ before removing the cell bayonet vent plugs. 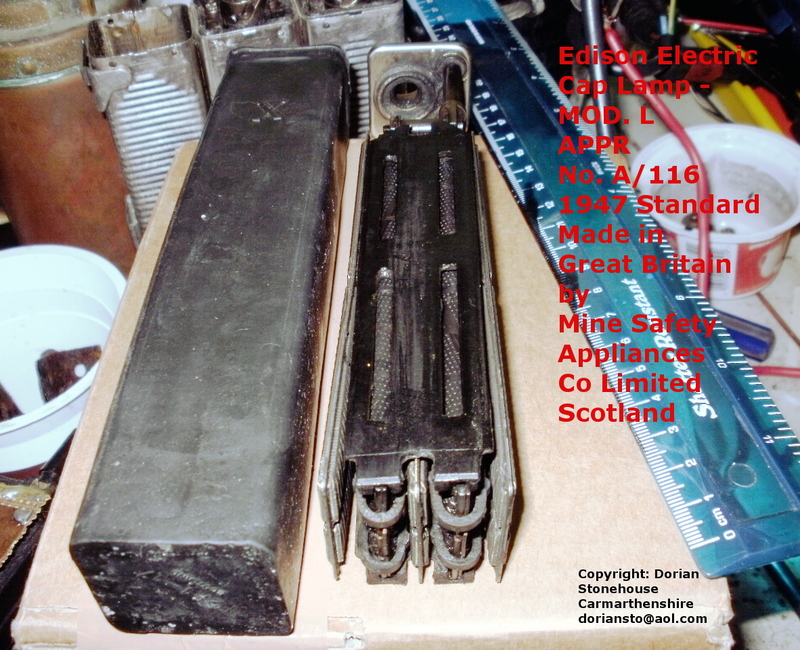 Edison Model P: It’s not too bad inside! 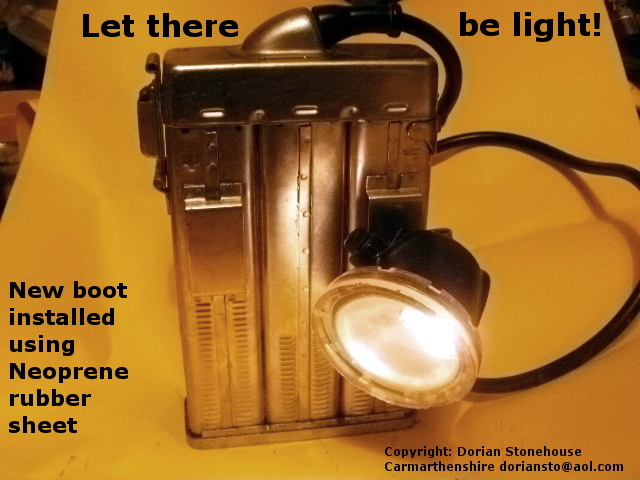 To view inside each cell, I used an adjustable focus led chip torch, instead of the dimmer tungsten bulb torches. Safety notice: potassium hydroxide electrolyte may still be present in the cells and this stuff will burn, so i used rubber gloves. I poured the old electrolyte safely into an alkali-proof container for disposal. Safety first: eye protection – safety glasses were worn at every stage of the refurb. Next, i rinsed the cells out completely with copious amounts of water to dilute any caustic potash remaining. 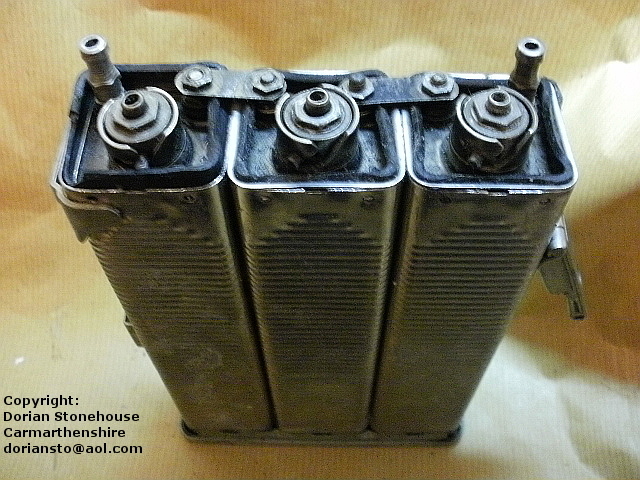 I repeated this procedure several times, before placing the battery upside down to drain away any excess water. It turned out that I only needed to replace two of the three rubber boots (see obvious signs of perished rubber below). Now came the tricky bit: to remove two out of the three square flanges ⇑⇑ (one of which is shown). 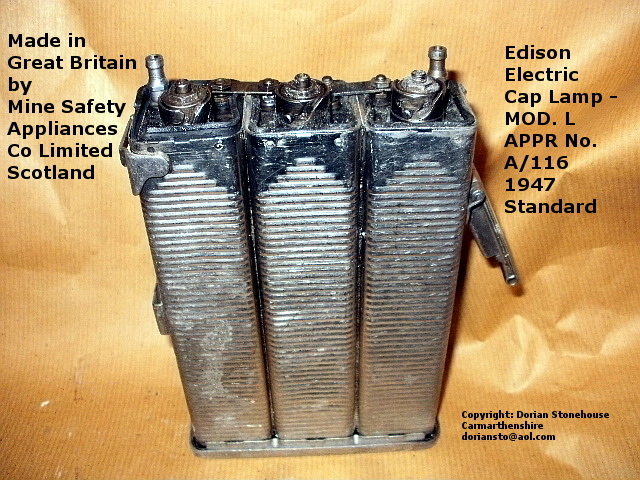 These awful things were squeezed between the top surface of each cell and the cap lamp metal body, thereby enabling the rubber boots (containing the cells) to be lifted bodily out of the case for replacement. There are little raised blips on the said flanges⇑⇑, which fitted into tiny holes in the case⇓⇓ to secure the cells in place. Using two screw drivers, I gingerly pushed one flat bit between each flange and the case, levering the blips from the holes. The second bit came in handy to prise the flange rims upwards, pushing up the rubber boots from the lamp body – a few millimetres at a time. 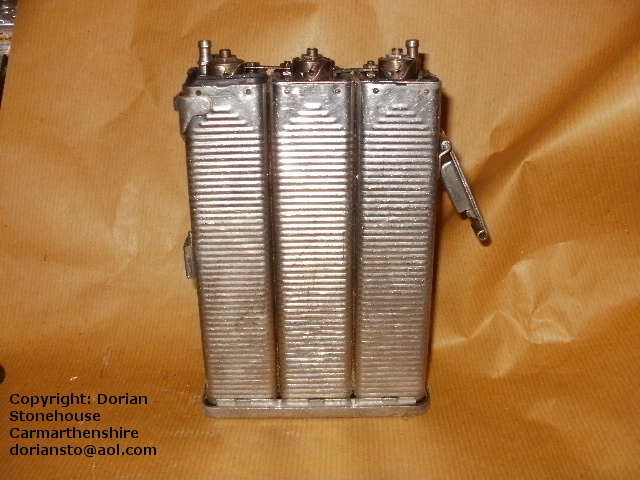 Gently pulling on each cell in turn eventually coaxed them to slide out of the outer metal case ⇑⇑. 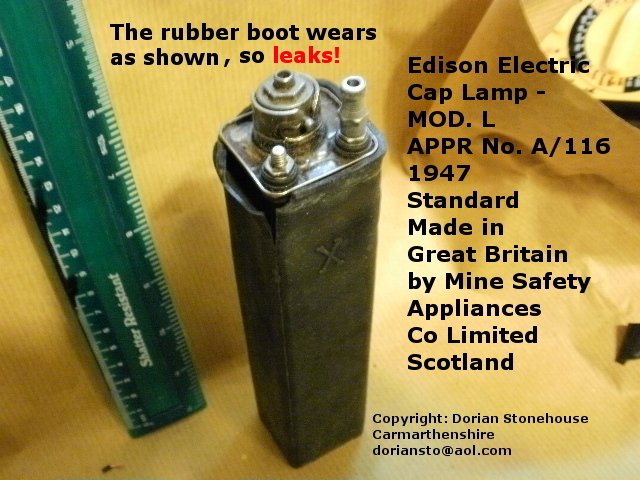 The perished and worn rubber container boots⇑⇑ had allowed the electrolyte to seep down the sides, causing a dangerous leakage. coincided exactly with the location of the metal flanges, which had obviously been digging into the rubber over many years⇑⇑. 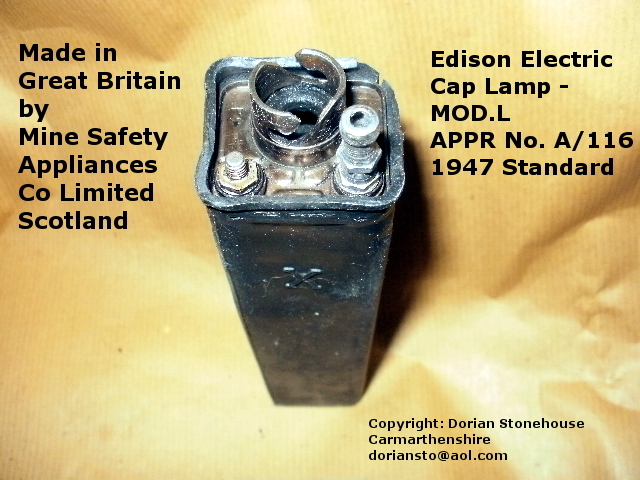 Edison Model P cap lamp: Getting it out at last! 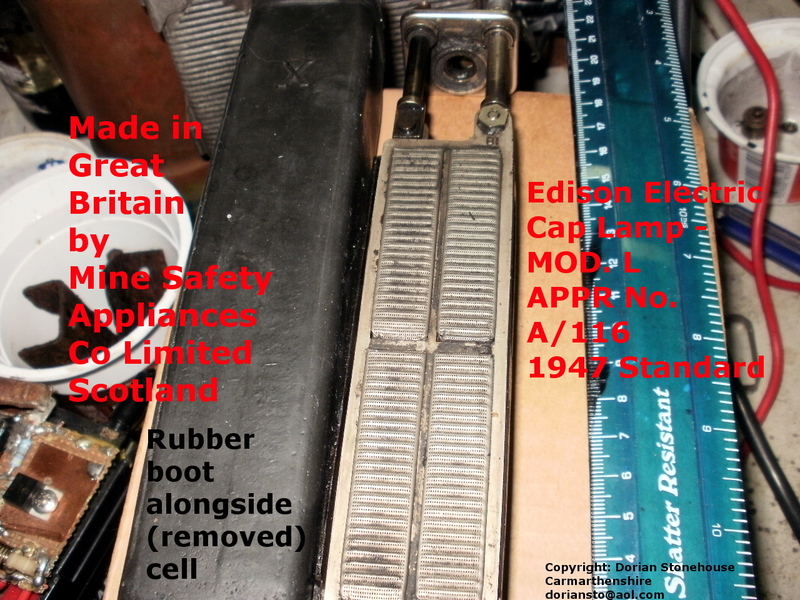 Once the electrolyte-free cells were removed from the body of the cap lamp, it only remained to pull each cell up ⇑⇑ and away from the rubber boot. In my case, replacing two of the three rubber boots called for some online research to find rubber material, along with a good adhesive, to glue the rubber seams together (explanation later), all of which had to be alkali proof. 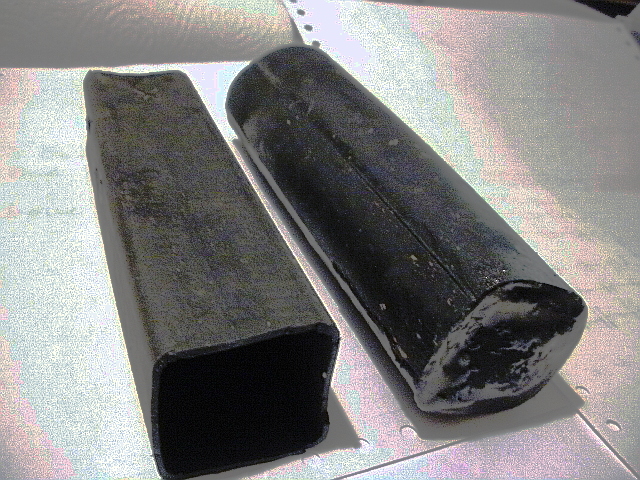 For these perished rubber containers, I settled for 20 x 30 cm neoprene rubber sheet (solid black smooth – thickness 1mm). It’s worth mentioning that even at this thickness; it was a struggle, due to the tight fit, to slide the new boots into the cap lamp body (more about this later too)⇓⇓. The neoprene has to be well prepared for gluing, by washing it with a degreaser; then sand papering the surfaces where the seams will overlap with fine sand-paper. As for the adhesive, I scoured the internet for a type that could withstand the potassium hydroxide electrolyte. I found a chart, which showed that a good quality epoxy adhesive was the best option – the one which has a syringe that keeps the resin and hardener separate. Testing the adhesive before use is vitally important, so i glued two tiny test sheets of neoprene together, and immersed them in alkali for two weeks. When I tried to pull them apart with a pair of pliers after testing, they had fused together nicely…success! To make up the neoprene boot, I placed each cell lengthways on the bench⇑⇑. The Edison cap lamp Model P: approaching touchdown! I carpet-rolled each cell with the neoprene sheet⇑⇑ tightly, allowing plenty of spare neoprene to overlap each cell at the top. The seam down the side of the cell had to overlap by about 2 cm to ensure a tidy glue barrier. Next, I glued both overlapping surfaces and placed two heavy old steam irons on each of the newly covered cells, leaving everything in place for about 24 hours. Next day, I took a pair of scissors and detached the base from the old rubber boot⇑⇑, being very careful to retain about a cm of the old boot wall. I applied epoxy to both old and new surfaces and then pushed the old base into the gap at the bottom of the new boot. I let it dry for 24 hours, then filled the new boot with water and let it stand for a few days, to make sure it didn’t leak. 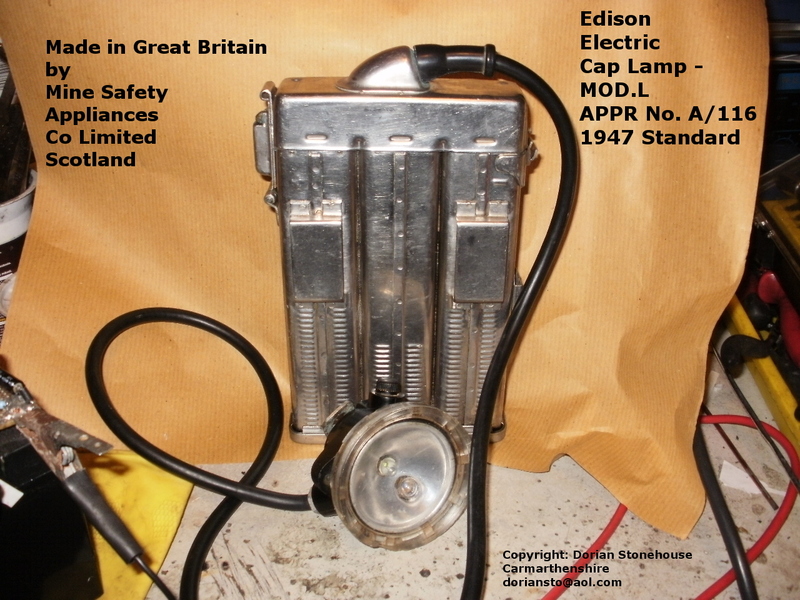 Edison Model P Cap lamp: Landing lights on? 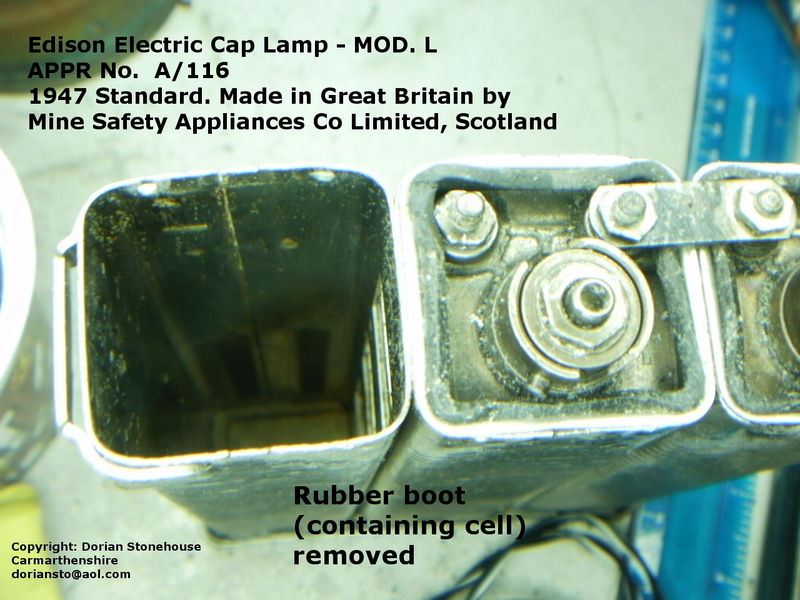 Sliding the new ⇑⇑rubber boot into the cap lamp body presented a bit of a challenge. I first had to smear water-based lubricating oil over the walls of the boots; otherwise, despite my best efforts, the boots refused to budge. The importance of using thin neoprene, now started to pay dividends, making boot insertion easier. With the boots firmly back in the main body⇑⇑, i found that trying to replace the square flanges was futile, as they began to dig into the rubber again. So I ditched the flanges and adopted a 21st century solution! 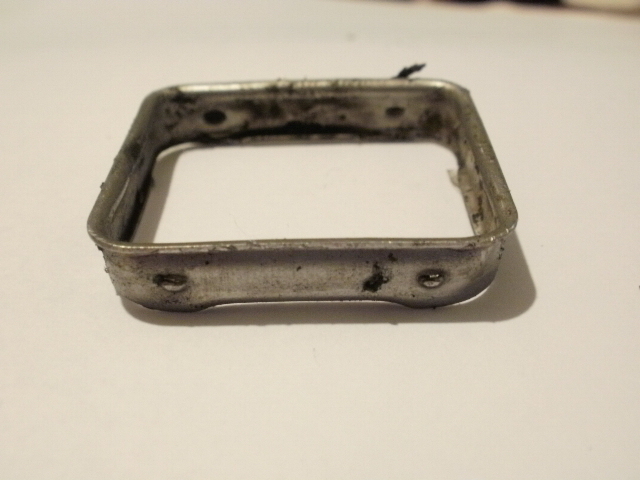 I applied epoxy adhesive instead all around the metal to rubber borders. The boots were then pushed back down into place and more epoxy adhesive added in the borders – further improving the water-tight seal. …Was all the work really worth it? 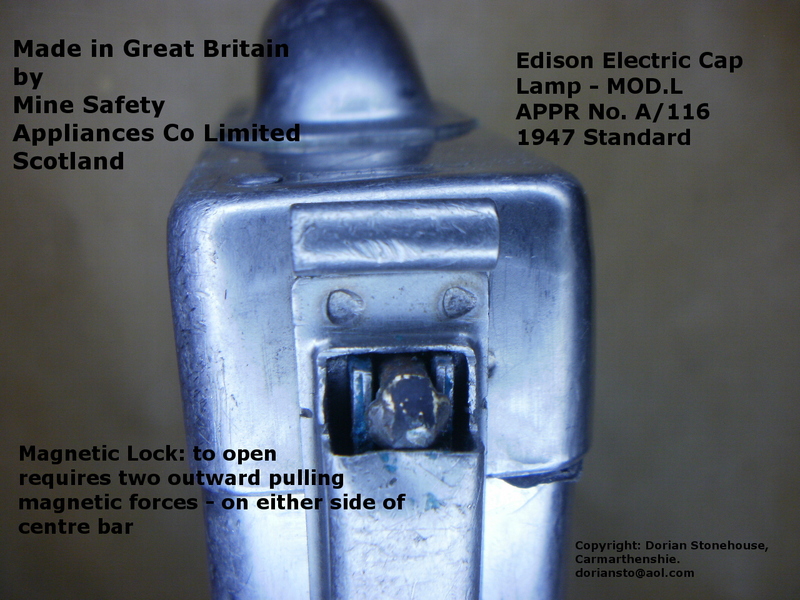 The model p cap lamp working – a wonderful light!